Can I still dye my hair? Is it safe to sleep on my back? Why is my friend's bump bigger than mine? Can I eat soft cheese? How do I know my waters have broken? What is colostrum anyway? Pregnancy is one of the most exciting times in a woman's life. It can also be one of the most confusing, thanks to rapidly evolving science and the sheer amount of information (true, false and otherwise) now available via the internet. Into this fray comes 9 Months, written by an Australian country obstetrician and father, Dr David Addenbrooke, who in his daily practice sees women of all ages with widely varying conditions, and a health scientist and mother, Ruby Matley. They combine forces to provide clear, compassionate and up-to-the-minute advice for soon-to-be mums and dads. - What is going on in each trimester, for both you and your baby. - All you need to know about screening, ultrasounds and tests in pregnancy, and your options for labour and birth. - How to cope with common symptoms, from nausea and fatigue to heartburn and back pain. - 40 recipes for ensuring optimum health for both you and your baby, plus the lowdown on which foods are in and which are out. - Reassuring information on weight gain, dealing with mood swings, connecting with your partner and bonding with your bump. - Practical tips for buying maternity clothes, preparing the nursery, budgeting for a baby and packing the hospital bag. 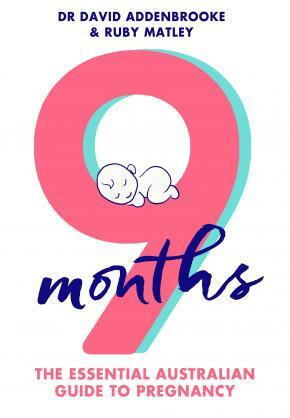 Easy to use and comprehensive, 9 Months is a complete guide for Australian women wanting the latest advice from a medical expert as well as practical reassurance and emotional support during the sometimes scary, but often wondrous, months of pregnancy.